Call of Duty 4: Modern Warfare introduces a variety of game play styles into the single player campaign completely new to the Call of Duty series. The game moves away from the standard three country-specific campaign style, and allows the plot to play through more like a film style plot with interlaced story lines from the perspective of the player as Paul Jackson, a member of the United States Marine Corps1st Force Recon and "Soap" MacTavish, a member of the British 22nd SAS Regiment. There is also a variety of cameo-style missions where you play as various other soldiers such as an AC-130 Spectre Gunship gunner, or as then-Lieutenant Price, a member of a two-man Black op sniper team behind enemy lines in a flashback-style mission. 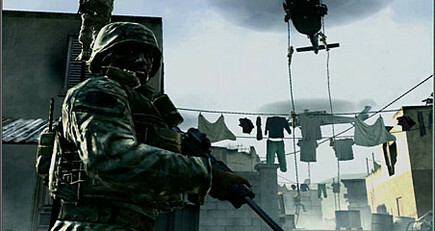 Call of Duty 4: Modern Warfare focuses on the variation of modern warfare as an infantry soldier by allowing the player to control soldiers in a vast number of different scenarios, straying away from the constant straightforward action of previous Call of Duty titles and allowing for both heavy intensity fire fights and slower paced drama styled intensity. 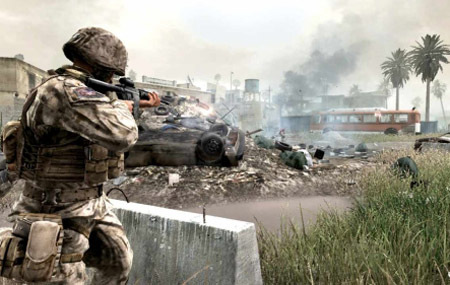 The series' move to modern warfare has also introduced a variety of new modern weapons and technology to be introduced to the Call of Duty submachine guns, and the franchise. Such showcased weapons and attachments include grenade launchers, and the AN/PEQ-2 Target Pointer for use in conjunction with night vision goggles, MP5SDFGM-148 Javelin portable anti-tank guided missile among many others. The multiplayer mode in Call of Duty 4: Modern Warfare includes a class system which has five preset classes with default weapon load outs and perks assigned to them, as well as allowing users to create five custom classes where the user can customize their weapon load out and three perks to assign to their soldier. The five default classes include Assault, Special Ops, Heavy Gunner, Demolitions, and Sniper. Only three of the default classes are available to a first time player; the rest are unlocked as the player gains more experience online and gains higher rank. Create-a-class can be unlocked at level 4; players can name and save their own custom classes for quick access in multiplayer matches. At Level 55, the player can then gain more XP from the game until they unlock Prestige Mode, which is a feature only available in the console versions of the game. In Prestige mode, the player can trade in their rank, all unlocked weapons and completed challenges and start over at level 1, in exchange for a special in-game insignia by their name. The player can then rank up and trade in their rank with Prestige mode again, up to ten times, with a different insignia awarded each time. This effectively gives the player 605 total ranks to achieve.Leaderboard stats (kills, deaths, playing time, etc.) are not affected by Prestige mode. Most of the new weapons and perks that players can use to outfit their custom class are unlocked as they gain higher ranks, but there are also a number of challenges associated with each weapon that subsequently open up new weapon attachments as players complete them. These items include improved weapon sights, camoflauge patterns, and magnification scopes. These benefits, are unlocked after attaining a certain number of kills or headshots. Completing these challenges also gives the player XP. Completing all challenges in a specific weapons category unlocks golden guns. Though these guns do not effect gameplay, they are seen by some as an important status symbol and are much sought-after in the online community. The player can also call in Unmanned Arial Vehicles (UAV, which brings up a form of motion-sensitive radar, depending on game type), air strikes, and attack helicopters by achieving a 3, 5, or 7 enemy player kill streak, respectively. 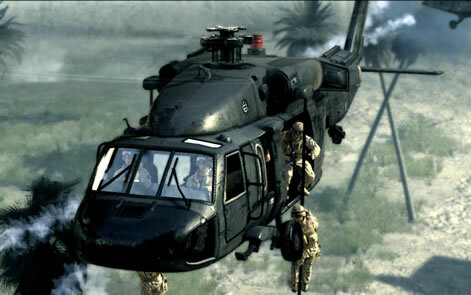 Any kills obtained through the use of airstrikes and helicopters are subsequently added to the using player's score.